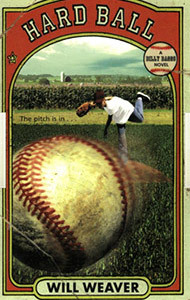 Third in a linked series of novels, beginning with Striking Out and Farm Team, Hard Ball carries a tight focus on the “bad blood” between Billy and his rival, Archer “King” Kenwood, the star pitcher on the town team. The coach comes up with a particularly ingenious solution to solve their conflict. In Hard Ball (as in the series) baseball is the hook, but its themes transcend sports. Hard Ball takes a close look at issues of conflict resolution, class, rural life versus urban, and the nature of family. A particularly important message in Hard Ball is that it’s possible to find solutions to problems without resorting to violence. “An offbeat, exciting narrative with a credible and thoroughly human hero.”—Kirkus Reviews. Billy couldn’t sleep. The August night heat, trapped in the attic of the farm house, kept him turning in his bed. That and Suzy Langen, the judge’s daughter who was never far out of his mind these days. Unfortunately, with thoughts of Suzy came King Kenwood, who was never far from Suzy’s side. He lay there imagining ways to get rid of King once and for all on tomorrow’s school trip. I struggled with Hard Ball–I think I needed a break from the farm, small town life, and baseball. As well, a series is tougher to write than you might imagine. But I particularly liked the matter of conflict resolution in HB. Overall, the three “Billy Baggs” books work well in grades 6-10, and particularly for young males who “never read” or don’t like to read. I think there’s one or maybe two more “Billy Baggs” inside my head–to be written someday.